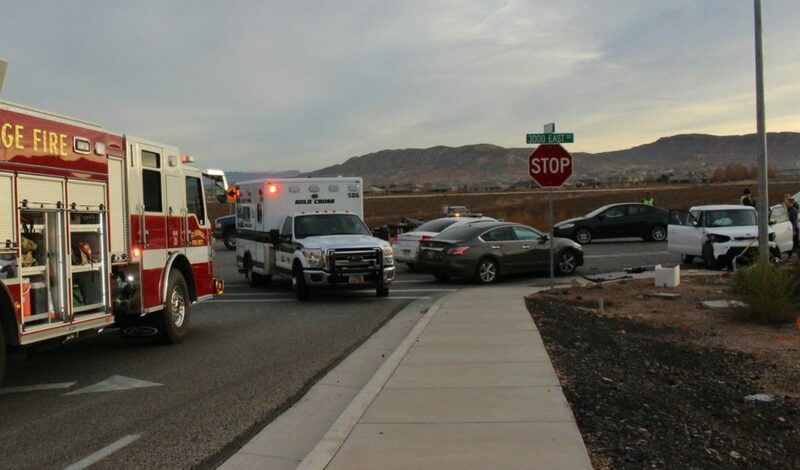 ST. GEORGE — Three occupants escaped serious injury in a head-on crash that resulted when a driver failed to yield Wednesday morning. 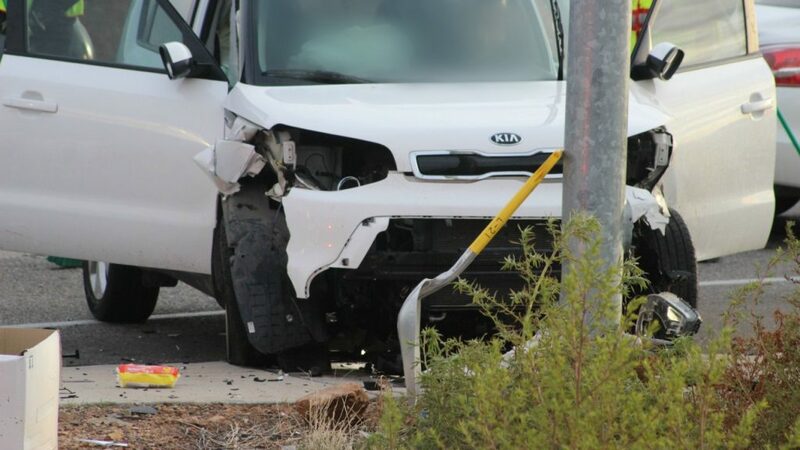 Shortly before 8 a.m. officers and emergency personnel were dispatched to a crash reported at the intersection of 1450 South and South 3000 East involving a white Kia Soul and a white Nissan Altima. 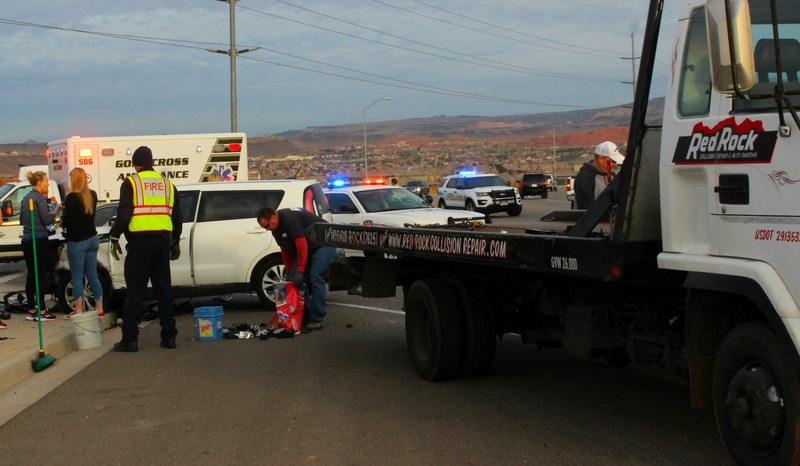 Upon arrival, officers found the Nissan in the center lane of 3000 East facing south, while the Kia was partially in the road and partially on the sidewalk that runs along the same street, St. George Police Sgt. Spencer Holmes said. 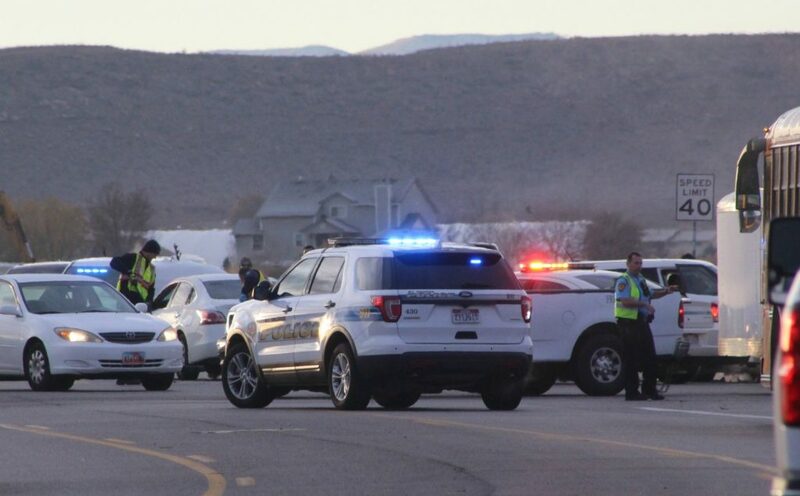 Additional police officers responded to the scene to redirect traffic away from the crash and divert all southbound traffic from 3000 east to an alternate route, with the only southbound travel lane completely blocked by the disabled Kia and debris that littered the scene. The driver of the Nissan and the two occupants in the Kia reported no serious injuries when checked by paramedics, Holmes said. 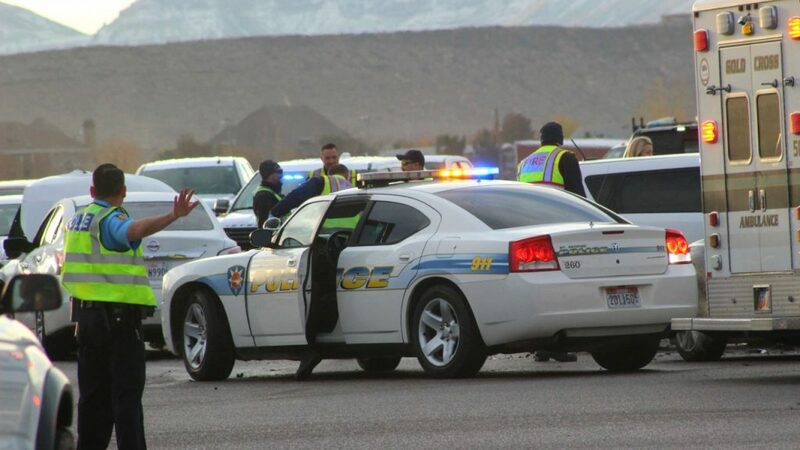 At the time of the collision, the Nissan was heading north on 3000 East when the driver attempted to turn left onto 1450 South and was struck by the Kia traveling south on 3000 East. “The Nissan pulled directly into the path of the Kia as it went through the intersection,” Holmes said. The impact spun both vehicles around and launched the Kia onto the sidewalk. Airbags deployed in both vehicles, but each sustained extensive frontal damage and were subsequently towed from the scene. Traffic was impacted for approximately 45 minutes. The driver of the Nissan was later cited for making an improper left turn, Holmes said. 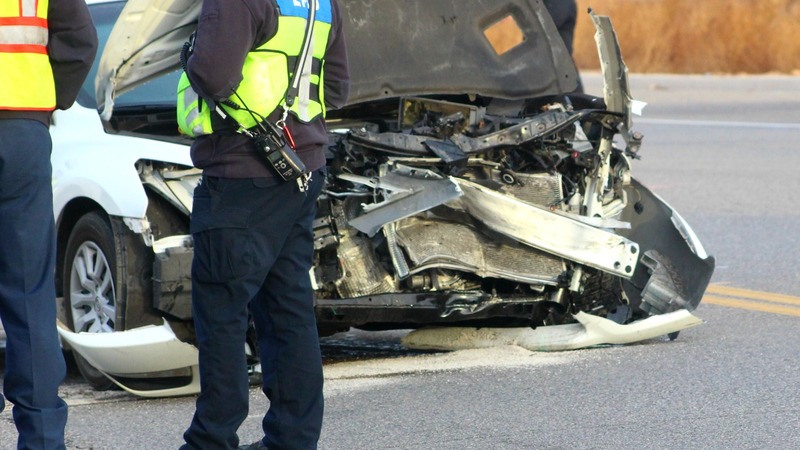 A crash analysis conducted by the National Highway Transportation Safety Administration in 2008 analyzed nearly 7,000 crashes over a three-year period, the first study of it’s kind by the agency in more than 30 years. The research found that more than 35 percent of the vehicles were turning or crossing at intersections just prior to the crash, which is the highest contributing factor in all crashes. The second-leading scenario involves a vehicle running off of the road which accounts for more than 20 percent of the crashes, while 11 percent failed to maintain proper lane travel and less than 10 percent lost control of the vehicle. Additionally, the study analyzed driving behaviors and cognitive processes that take place just prior to and during crashes, and found that more than 40 percent were directly related to recognition errors, including inattention, internal and external distractions and inadequate surveillance, while nearly 35 percent were associated with decision errors, such as driving aggressively, speeding and so on. Finally, about 10 percent were caused by performance errors like overcompensation and improper directional control. I have an idea. Why don’t we build hundreds and hundreds of houses on the south end of 3000 East. Let’s leave the road in it’s unimproved condition, and laugh at the people who try to navigate it. Maybe even place an elementary school which has all of it’s studentbody needing to be dropped off, and picked up by their parents, each in their own vehicle. Let’s put in a manhole every 100 feet or so, so the motorist are swerving in all directions. All of of this then let’s not put in any traffic signals to help with the traffic flow. Serious, 3000 East is such a terrible road. It doesn’t even have a common curb line. The road juts one direction along a development, the juts the other direction at the next development. The City didn’t require the builders to maintain a straight edge, so the road could run straight. This road should already be two lanes in each direction with a center turn lane. There should be a couple of properly placed traffic lights to assist the cross traffic. 3000 East is getting to be like the new portion of Mall Drive. It can’t handle to amount of growth the City is allowing. There should be an emphasis on the infrastructure if St. George City want to continue growing at the pace they are. Stay ahead of the growth before you fall to far behind. The City leaders are not interested in quality of life, they are interested in growth and the money it brings. I won’t even ask what we are going to do for water with this growth. Welcome to the world of Utah roads. Build houses and schools first, then worry about how to get to them later. That’s the Utah way. Oops.. you left out build another temple lol ! Get used to it or move. Problem solved! I have another idea, how about enforcing the law more with all the people that run stop signs, red lights, tailgaters and no blinkers? Ask them, and their response would be “why would we do that?”. 3000 East is dangerous but Mall drive in front of Smith’s is deadly and only a matter of time until someone is killed. Now they are going widen the road in front of Riverside elementary going down to Washington Fiends road. This may help with some traffic on 3000 east going towards Mall drive but the planning was horrible to not put in a light so people could safely exit Smiths. I was there just after sunset trying to turn left. The traffic flow was horrible and dangerous. As soon as I pulled out to turn left I was al.ost hit by another person trying to pull out behind me. As I was paying attention to that and swerved so that car wouldn’t hit me u looked forward to see 2 small boys (less than 10 years old) who had run across the road right in front of me as they saw the same chance to get across. I’m not sure who’s planning it was but they should be fired. It has nothing to do with poor road planning and everything to do with your lack of Faith in the Lord. Trust in the Lord and you will be OK. While we’re at it- raise of hands how many of you have seen people driving around with no head lights on when the sun had set nearly two hours ago? I see it every night on my way home from work and it is seriously concerning to me, yeah?